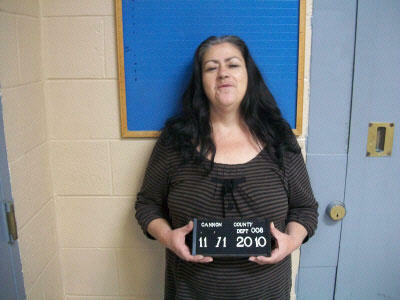 A Sept. 11 court date was set for a local woman after she was arrested on a number of charges on July 19. Leslie Lynne Beilfuss,4090 Jim Cummings Hwy, Woodbury, was charged with Aggravated Assault, Disorderly Conduct and Resisting Arrest. Cannon County Sheriff’s Deputy Seth Perry first made contact with Beilfuss, who reportedly has a history of mental illness, when he was dispatched to her address following a report of a person screaming. Upon arrival Deputy Perry heard a woman scream as loud as she could some obscenities followed by a death threat claiming she had possession of cannons. As he approached Beilfuss, she turned to Deputy Perry and stated that she could worship her god however she wants and he the Father would cut Deputy Perry's head off. Deputy Perry then radioed Deputy Brandon Gullett to come to the scene to provide assistance. Once Deputy Gullett arrived he and Deputy Perry tried to talk Beilfuss into going to the hospital to get some help. At that point Beilfuss became even more irate, screaming and yelling more obscenities. Deputies had to use chemical spray to control Beilfuss, who continued to fight all the way to the hospital. Once at the hospital she was restrained as she continued to fight to the point where she attempted to bite the hospital staff. Deputy Perry continued to help the hospital staff try to subdue Beilfuss, who then turned and spit into Perry's face. After hospital staff finished clearing her, Deputy Perry transported her to jail and released her to booking.